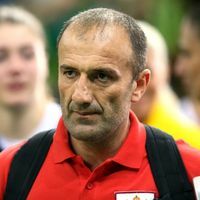 The eight-year stint of Dragan Adzic as head coach of the Montenegrin national women’s team has come to an abrupt end. Adzic has been replaced by Per Johansson with immediate effect. The Swedish coach will be officially presented and lead his first training in Bar on Tuesday. The decision ends an important era for the team. Under Adzic, Montenegro won silver at the London Olympics and gold at the EHF EURO in Serbia, both in 2012. “I don’t want to, and I have never put myself above the interest of Montenegro. I am always there for Montenegro, now, before and in the future. I wish all the luck and good health to those girls. I will be their biggest fan,” Adzic is quoted in the statement by the federation. The separation comes as a surprise, not just because of its timing. In September 2016, the federation rejected Adzic’s resignation after Montenegro had a disappointing showing at the Rio de Janeiro, were they lost all five group matches. Johansson, who previously led his native Sweden to silver at the EHF EURO 2010, was successful recently with CSM Bucuresti, which he steered to the Women’s EHF FINAL4 in May. The Swede has been hired just for the duration of the World Championship, which will run from 1 to 17 December in Germany. In the preliminary round, Montenegro are sharing Group C with Denmark, Russia, Japan, Tunisia and Brazil. Johansson will have to do without injured players Marija Jovanovic, Majda Mehmedovic and Andrea Klikovac. On the other hand, under his leadership Katarina Bulatovic and Jovanka Radicevic are returning, at least for this competition. Following the 2016 Olympics, Adzic started rejuvenating the team and left experienced players like Bulatovic and Radicevic out of his squad for the Women’s EHF EURO 2016 in Sweden, where Montenegro were eliminated on goal difference in the preliminary round. For the World Championship, a total of 18 players have been nominated for the final training sessions ahead of the team’s departure to Germany.